The MTA is creating new bus routes and extending service on multiple lines citywide to support a growth in ridership, officials announced Aug. 26, 2014. NEW YORK CITY — The Metropolitan Transportation Authority has invested $4.9 million in new bus routes and extending service on multiple lines citywide as a way to accommodate the city's growing population, officials announced Tuesday. 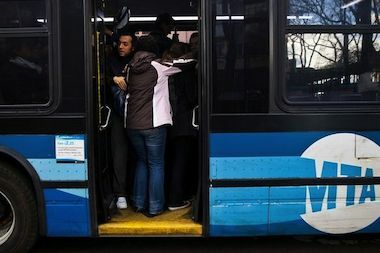 The expanded bus plan, which is slated to mostly roll out on Aug. 31, involves three new bus routes across Manhattan, Staten Island and Queens, as well as other bus improvements across the city. “New York City changes all the time, and we must keep up by making accommodations and adding service when the need arises,” said NYC Transit President Carmen Bianco. “We are committed to improving reliability for service for our customers in all five boroughs. In Manhattan, the new M12 bus service will be added to meet added demand on the Far West Side due to the growing population in that area, according to the agency. Transit boosters cheered the added bus service. "Four years ago, New York City transit riders saw the worst cuts in a generation," said Cate Contino of the Straphangers Campaign, referring to the MTA's slashing of services in 2010, including 20 local bus routes, caused by a budget shortfall. "Since then we've advocated for the restoration and expansion of bus and subway service," she said. "The announcement today by New York City Transit to expand bus routes around the city just goes to show how important local service is to our communities." Two of the service improvements will begin on Sept. 2, and the rest will launch on Aug. 31. ► Q113 Local becomes Q114 - The Q113 local will be reworked as the Q114 Limited to provide quicker service along Guy R. Brewer Boulevard in South Jamaica and Rochdale Village, the agency said. The new Q114 route will make limited stops along the Brookville Boulevard and through Woodmere, Cedarhurst, Inwood, Lawrence and Far Rockway. It will make all local stops along the Guy R. Brewer Boulevard from midnight to 5 a.m. The Q113 Limited will continue its limited-stop service from Jamaica through Far Rockaway, and the Q111 will continue to make all local stops from Jamaica through Rosedale. ► Q17, Q27 – The terminals for both routes in downtown Flushing will be relocated from Main Street between 39th Avenue and Roosevelt Avenue to 138th Street between 39th and 37th avenues. ► M12 - The entirely new M12 bus route will service riders along 11th and 12th Avenues between Abington Square in the West Village and Columbus Circle. The northern terminal will be on West 58th Street at Broadway. The southern terminal will be on Eighth Avenue at Jane Street. ► Bx24 – The route will be extended from Westchester Square to the end of Marconi Street by the 911 Call Center in the Hutchinson Metro Center. The extension, which adds four eastbound stops and four westbound at the Metro Center, is an “example of the NYCT works with residents, businesses, and elected officials to address a need,” the agency said. ► B13, B83, Q8 – All three routes will be extended to a new bus terminal at Gateway Center II in the Spring Creek section of Brooklyn. ► S93 – Midday and evening service (beginning Sept. 2) will be added to the limited-stop route that travels between Bay Ridge in Brooklyn and the College of Staten Island via the Verrazano-Narrows Bridge. Buses will run between 5:45 a.m. and 10 p.m.
► X21 Super Express – This new route (launching Sept. 2) is coming to Eltingville in Staten Island via the X21, which will travel to Midtown Manhattan along 42nd Street. It will operate during morning and evening peak hours, making a limited number of stops and offering a “faster commute” for riders of existing Staten Island express buses. The terminal in Manhattan will be located at East 41st street and First Avenue. The new Staten Island terminal will be located in the Hyland Boulevard bus loop on Richmond Avenue.